Customizer from around the world were represented by their works of art to show and show off even when the furlong race. Shun Miyazawa from Japan came with a Yard Build Yamaha, Conor Cummins (Isle of Man TT – driver) was with the Z1000 “sprint Fire” spot, Winston Yeh (Taiwan) went on a XJR1300 to just to name a few. 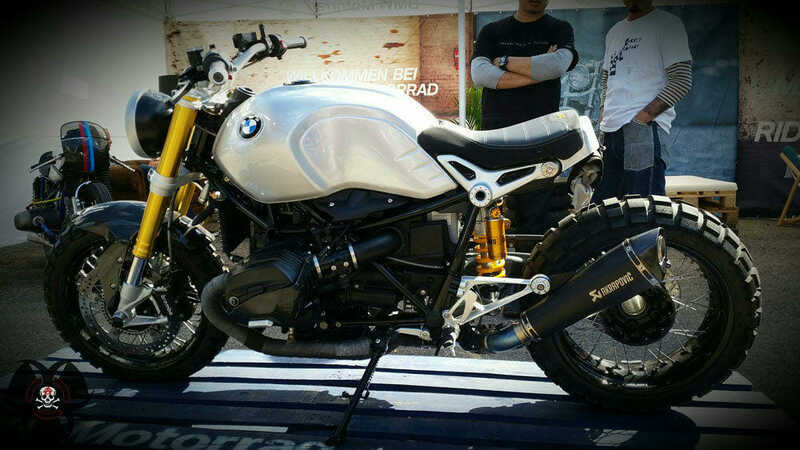 French, Spanish and of course German riders and customizers were also represented. Even thereto can be seen how big the event has now become, and how much in vogue. Complete list of drivers Poets of Sprint below. The show race drew some time back, there was a lengthy interruption. Viewers had to first clear the ADAC grounds and the space under the bleachers, but more about that later. At the first show race it was state power against omnipotence. Police Officer Jürgen Hauber ran against Pastor Jürgen Schwarz. Then there were two runs of Francesca Gasperi (test driver Kawasaki) on a Ninja H2R and Troy Corser, the two-time SBK World Champion, with the Lotus CO-1. Since a clear decision could not be made to clarify a third run. The third run was postponed because the H2R threatened to overheat. 1/8 mile race with a long service life are not the natural environment of a 300 horsepower monster. Announced was then actually the 101 Sprint International, the main attraction (if you can “only one” speak of), but it was the Ladysrun – 4 Ladys 4 Sportbikes – preferred. Nina Prinz came here with a Suzuki GSX-R 1000, TT rider Maria Costello with BMW S1000RR, Florence Chatokhine with Ducati Panigale and Francesca Gasperi this time with Kawasaki ZX–10R. After the award ceremony of the ladies, Nina Prinz could pocket the victory, the outstanding Run between Kawasaki and Lotus was held. Some were too many sports bikes at once. 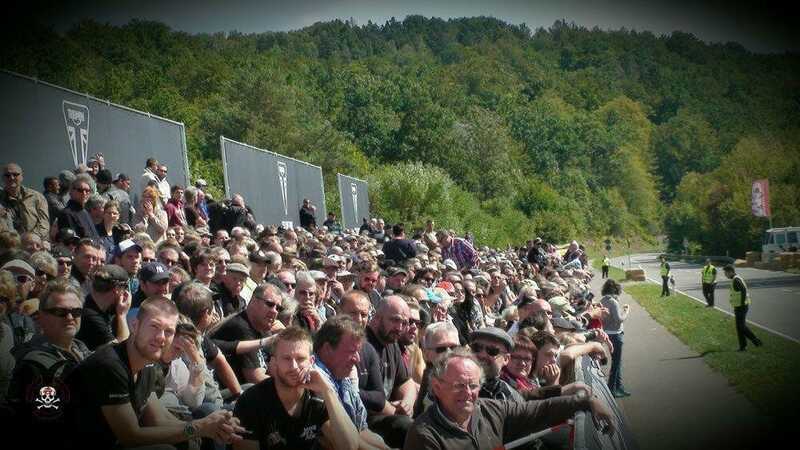 The Showruns, the mass of visitors, too few visitors in cafe–racer outfit and the presence of sponsors has raised the debate in the social network whether Glemseck 101 lost his Spirit. -Whether It is still only commercialism. I think that can not be answered generally one and everyone sees differently. But most were extremely enthusiastic. The fact that the event changed over the years has also clearly and alone owed the rush of visitors. For those who know the old Glemseck 101, but it is often no longer the same. How much of the HIPE comes to debt because of the anniversary will be seen next year. But the fact is, it’s still free. The event is instructed to insist on sponsors to continue and to improve. The test for this can be seen also at the grandstand. International participants occurred in a 1/8 mile race against each other. First there was a trial run and then the race. Two participants, a winner. The loser was out. With an early start, the race was repeated. 2015 it happened for the first time that a rider lay two jump start succession. This was followed by disqualification. 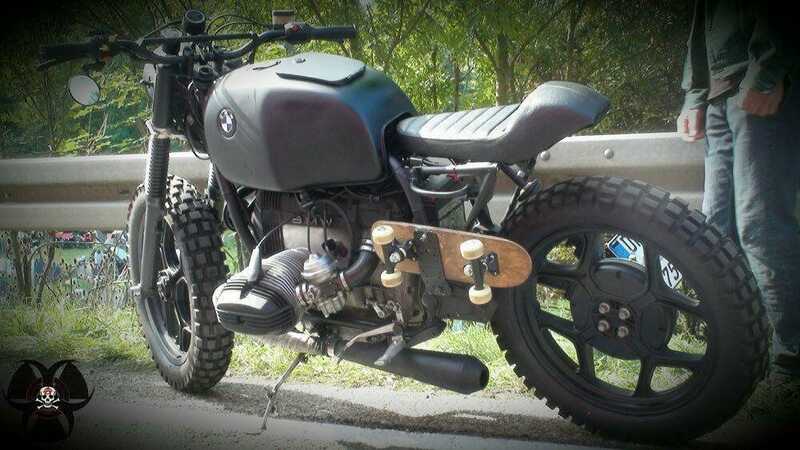 It was a pity that it was banned this year, fueling with burnout the tires. Everyone did not waste it. For most however, it has been lacking, it belongs fixed to each Drag Race! Here the idea of the rider and the motorcycle in the video – the link to the second part will appear towards the end. 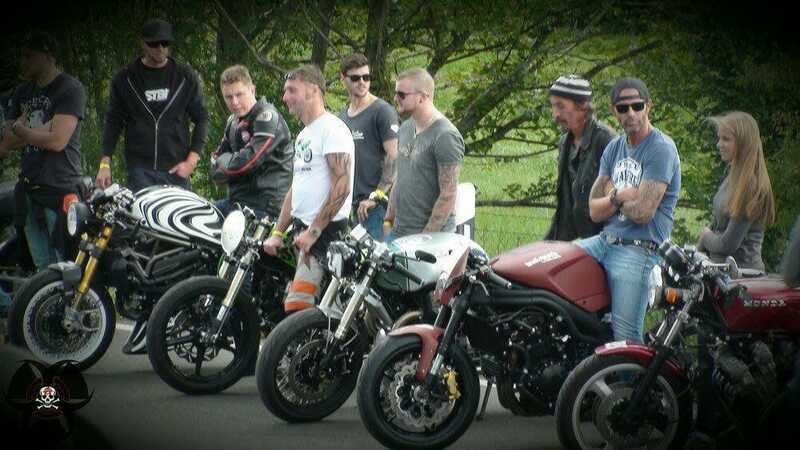 Triumph sponsored the 10th anniversary a grandstand. In recent years, the audience had to stand behind a barrier, and accordingly was also the view. Who would not secured early enough a place had bad luck. By Tribune that should be improved, but it was not enough for the huge rush. You could easily be twice as large. To better or even to be able to see, many climbed the garages on adjacent ADAC grounds or under the grandstand. 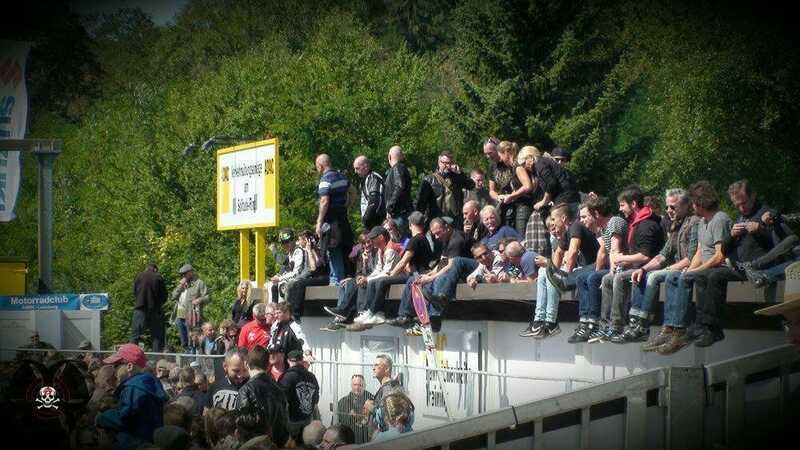 This could not be permitted for safety reasons and the spectators had to vacate their seats. The races were stopped in time. For great resentment caused a portion of the grandstand was intended for “VIPs”. Here was still a bit of space, but without VIP tape could not be on it. The term VIP – was chosen perhaps a bit unfortunate. For many, it came as across as if they were second-class visitors, but that was certainly not meant that way. After a period of half spaces was given freely, and later the entire places. In this way was the whistle, which was intended as an absolute plus for 2015 in which many have bothered to something. As I said, it was the first year with grandstand. With such problems had not counted on in advance, and only did not even deal with it. Apart from the International Sprint, there were several additional runs. “Franco vs. Allemand – the Revance” called the race between French and German drivers. Earlier this year, was Glemseck101 to prove a guest in near Paris there against a group of Frenchmen to Furlong. Germany lost. Here there was the rematch. With the “MO Cafe Racer Sprint” with 32 participants, the rigid frame bikes “Starr Wars“, the “BMW Motorrad R Nine T Sprint“, “Who wants to kill the cat”, the “Classic–Racer–Sprint” and the “MO–690 Classic Sprint “there was plenty of action at the weekend on the former Solitude Racetrack.